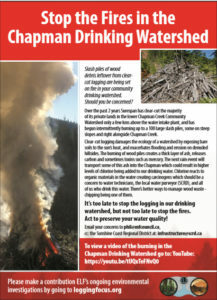 Please note attached a video clip of the slash burn recorded Sept. 13th in the Chapman Drinking Watershed. The total number of slash piles has not been systemically counted, however taking into consideration the large area clearcut by the private land owner (Surespan) on the east and west of this watershed the estimated number of piles is 100+/-. It would appear that approx. 4 piles on the west side have been ignited at this time. A recent Yale Environment article ‘How Wildfires are Polluting Rivers and Threatening Water Supplies‘ sites the effects of wildfires on drinking watersheds across North America. While slash pile burning is not as wide spread as a wildfire, the effects of woody debris being burnt (ignited) from a slash pile leads to similar toxic gases being released and vulnerable soil conditions being left behind is similar. Below are key quotes from the article that should alarm the SCRD as the watershed purveyor. Due to the science that’s looking at the outcomes of fire in drinking watersheds, our organization concludes that what is happening in the Chapman Drinking Watershed poses a health risk to water consumers. To that end, will the SCRD contact Vancouver Coastal Health tomorrow morning and together make a request to the Managed Forest Council to issue a Stop Work order to the member company Surespan? The RD should not idly stand by and have all of these slash piles burnt and just hope for the best. Now is the time to act. Please advise on the RD’s next steps on this issue. Water treatment plants in those places were overwhelmed by sedimentation, dissolved organic carbon, and chemicals that were released by fire. The intense fires removed many of the trees from parts of the mountain landscape. In the hot drought conditions that followed, the soils in those denuded landscapes baked. Some spring-fed streams stopped flowing. Chemical compounds that were vaporized by the fire got driven into the soil. As they condensed, they formed an impervious layer just below the surface. Without trees, vegetation, and a stable soil structure to absorb the heavy rains that followed,tons of ash, debris, heavy metals, and nutrients were flushed through the watershed.